What lurks deep within the Ghost Train? What secrets are to be revealed in our side shows? This Carnival is packed with magic and illusion around every corner. 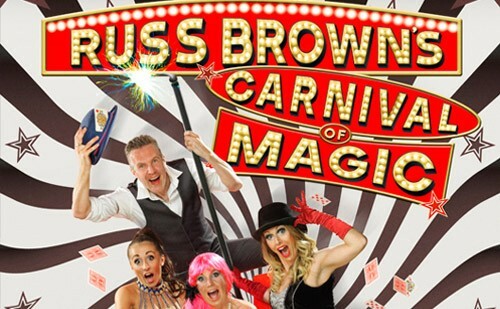 Enjoy a fantastic evening with award winning magician Russ Brown at his Carnival of Magic and who knows, you could even be the star of the show. Every Saturday & Sunday from 9th September until 15th October. Then everyday except Saturdays from 16th October until 5th November. Call 0871 222 9090 – Calls will cost 13 pence per minute plus your telephone companies access charge.